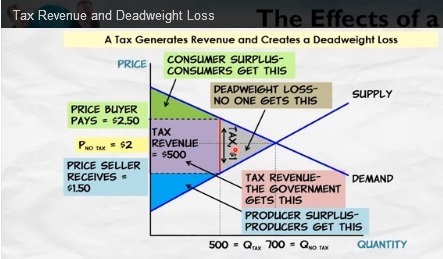 For more than 30 years, I’ve been trying to educate my leftist friends about supply-side economics and the Laffer Curve. Why is it so hard for them to recognize, I endlessly wonder, that when you tax something, you get less of it? And why don’t they realize that when you tax something at high rates, the effect is even larger? And if the tax is high and the affected economic activity is sufficiently discouraged, why won’t they admit that this will have an impact on tax revenue? Don’t they understand the basic economics of supply and demand? But I’m not giving up, which means I’m either a fool or an optimist. In this Skype interview with the Blaze’s Dana Loesch, I pontificate about the economy and tax policy. I made my standard points about the benefits a lower corporate rate and “expensing,” while also warning about the dangers of the the “border adjustable tax” being pushed by some House Republicans. But for today, I want to focus on the part of the interview where I suggested that a lower corporate tax rate might generate more revenue in the long run. That wasn’t a throwaway line or an empty assertion. America’s 35 percent corporate tax rate (39 percent if you include the average of state corporate taxes) is destructively high compared to business tax systems in other nations. Last decade, the experts at the American Enterprise Institute calculated that the revenue-maximizing corporate tax rate is about 25 percent. More recently, the number crunchers at the Tax Foundation estimated the long-run revenue-maximizing rate is even lower, at about 15 percent. You can (and should) read their studies, but all you really need to understand is that companies will have a greater incentive to both earn and report more income when the rate is reasonable. But since the U.S. rate is very high (and we also have very punitive rules), companies are discouraged from investing and producing in America. Firms also have an incentive to seek out deductions, credits, exemptions, and other preferences when rates are high. And multinational companies understandably will seek to minimize the amount of income they report in the United States. Though I confess that I’m not overly fixated on whether that leads to more revenue. Remember, the goal of tax policy should be to finance the legitimate functions of government in the least-destructive manner possible, not to maximize revenue for politicians. P.S. Economists at the Australian Treasury calculated the effect of a lower corporate rate and found both substantial revenue feedback and significant benefits for workers. The same thing would happen in the United States. I like a seriouly limited government,, SO How about a simple flat 10% retail sales tax and No other taxes of any kind at any level of government…. Then let Federal, State and Local govt fight over that 10% !!!!! Of course the long range corporate tax revenue maximizing point is lower than the short term maximizing point. It’s because in the long run the dominant factor in both prosperity and the revenue that can be raised by taxing that prosperity is …(drum roll) … Yes, growth! Growth, the only thing affecting prosperity in the long term. That is why, as I have said many times, as the time horizon under consideration expands into the longer and longer term, the Laffer curve takes the shape of the Rahn curve. It is the reason why Switzerland now raises more tax revenue per capita than France. As one might keep saying “it’s the growth,stupid!”. Talking of growth, we are still at half the average worldwide annual growth rate. So we’d better do something fast because the growth deficit is compounding fast and we are headed straight into the middle income countries of this world past midcentury. Anyone supposes leftists will learn the simple arithmetic of compounding and address the urgent need to match worldwide average growth rates? Oh that’s right, we need not worry much about the future since in about one century climate change will wipe out Homo sapiens from the face of the earth. Well, guess what? America’s decline into the middle income countries will come a lot sooner than that on current growth trajectories. Not sure what Eugene is talking about. Seems his solutions call for even more government oversight, and bureaucracy than the current system, with the cheaters winning. Anyway, that’s not why I wanted to comment. My comment is this: leftist confuse me with their dichotomy of thought. They were extremely excited when the government came up with “sin taxes” on alcohol and tobacco. They cited in many cases how the taxation itself would discourage use of such products. Yet, they still seem to have forgotten that argument when asked what the result of excessive taxation of work product might be. I, for one, personally grow more disgusted every day of working hard to pay my taxes so that some other individual can take the money that I have created, and use it to sit around the house until the next protest against people like me can be organized. People like me… the most overworked and protested on the planet. I get it- I am a white man who sits at his desk while working to support them, and harbors evil thoughts about them- producing more carbon, killing more polar bears, and generally making the world a worse place to live the extended lives that the technology I produce gives them. Hmmm- John Gault might have had a point. Too bad Ayn Rand wasted so many pages trying to get it across. If Dan Mitchell ment what he says about low rates he would tax all three tax bases: wealth, consumption (VAT), and income to reduce the high payroll-income-C corporation rates. Consider just a simple 4% VAT to replace the 7.65% business portion of payroll taxes. It would help workers, provider border adjustment and not harm consumers. If Mr. Mitchell really wanted to help he would support the inverse taxation of wealth and income and let taxpayers choose there own rate. Imagine a federal income tax that ranged from 8% to 28% that was paired with a wealth tax ranging from 2% down to zero (and no payroll taxes). To encourage economic mobility, a sum of $500,000 could be saved wealth tax free (for retirement, health care or education). Wealth taxes paid over a lifetime would also offset estate taxes of 28%. In such a system, both family wealth and income would determine how much, if any, government welfare would be needed. With data on both wealth and income, health care could be based on what families can afford. Corporate tax reform would be as simple as replacing the payroll tax with a 4% VAT and lowering the C corporation tax to 8%. Is it really true that you can’t teach an old dog new tricks?